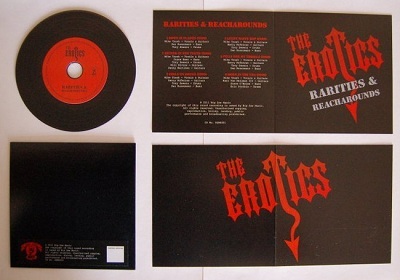 "Rarities & Reacharounds" is a limited edition EP from The Erotics, which consists of six previously unreleased tracks recorded between 1996 and 2001. The EP is on a Vinyl effect CD, in a plain black sleeve & a gatefold inlay with track details, giving it a very retro feel. The EP is limited to 100 copies, all hand numbered, making it a must for the bands fans. While the bands last album ("Today The Devil, Tomorrow The World") had a sleaze rock feel, the tracks on this EP have far more of a punk sound, but its not pure punk - the sleaze feeling is still there, it's just not as prominent as in their newer material. Some of the songs on this EP - "Girls on drugs" and "pills for my thrills" in particular, remind me of the current Michael Monroe album, Sensory Overdrive, which has a punkier edge to it than his music with Hanoi Rocks, and that resemblance can only be a good thing given the praise that has been widely given to the Michael Monroe album. "Luuft waffe bop" has a nice Ramones feel to it, and the title reinforces that feel with obvious comparisons to the Ramones hit, Blitzkrieg bop. The cover of "Born in the USA" is excellent and the EP would be worth buying for this track alone, but it's by no means the only good track on the EP - the whole EP is very good. An EP to listen to again and again.